Consigned to the 2016 Horn Showcase sale. 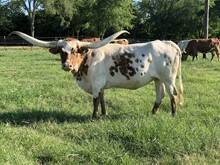 Rio Phenomena is a beautiful cow with sweeping lateral horn and a special pedigree, combining JP Rio Grande, Phenomenon, and Bet I Can families together. Check her out. Bred to HUBBELLS 20 GAUGE for a 2017 spring calf.